Taste test: These are very tasty rippled chips with a nice, soft crunch and a good potato flavor. The texture is a lot like some other soybean oil-based chips, but these are crisper and have a less greasy taste. One of our tasters said they tasted like potato sticks. Smell test: Good and potatoey. 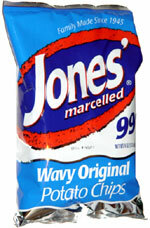 Company: Jones Potato Chip Co.